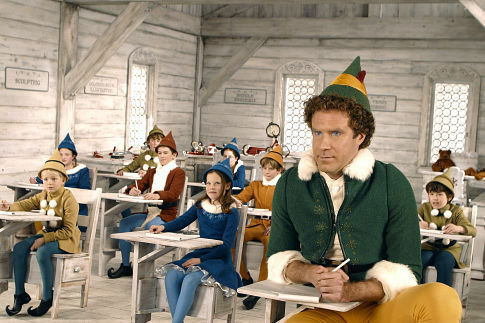 Elf (filmed in 2003) is a funny Christmas movie that features Will Ferrell. It’s about a guy who is raised as an elf in the North Pole and because of his size is forced to move to the U.S. where he finds his father. He lives the elf culture treating life as an adventure. He eats everything with sugar on it including spaghetti which he tops with syrup. Lots of syrup in fact. I give it 4 stars out of 5 just for the wit and comedy and the fact that I’ve watched it perhaps 5 times in the last few years and it is always funny. It’s filmed in a sort of style where it reminds you of other classics like It’s a Wonderful Life or Miracle on 32nd St. Maybe those films and throw in a little bit of the old animated classics like Rudolph the Red Nosed Reindeer. That was apparently intentional as they hope the film will become a classic. I’m sure it is too soon to tell whether that will be the case however it has the sort of humor that could last a lifetime. I think what is lacking in this story compared to, say the previously mentioned movies, is a significant moral to the story. This movie pokes fun at Santa and provides some witty scenes showing how boring our lives and daily routine can become. It shows a family dealing with an unexpected turn in life and make the decision that family is more important than everything else. Or at least, that’s my best take on it. Since “Buddy” (Will Ferrell) has never experienced city life he blunders through almost everything with a lovable curiosity even causing problems for others and himself and realizing some of the sad moments in life. Overall it’s a genuinely funny movie that is designed to be family friendly. I can never get tired of this movie. Hilarious! Well, at least one person on this planet shares my sense of humor. it’s a funny movie. it also reminds me of a movie an old with tom hanks, a kid wishes he was bigger and after he went to sleep the next day he is a man(tom hanks). I thought at first that watching this movie will bore me but it was the other way around. I got a glimpsed of it and it was done in a comic way which makes it more exciting and funny. You will surely enjoy this type of movies.